More work flexibility please ! Beewake has been created to help corporations to manage their mobile workforce and therefore support employees to be more flexible at work. Today, we dive into the reasons why it’s both beneficial to corporations and employees to be flexible and to work out of the best workspaces possible. At Beewake, we believe in workspace freedom, remote worker, digital nomads, working from home, coworking, working while traveling, flexible work schedules, telecommuting, company remote work strategies. Today but more than ever, work does not start anymore at 9 or end at 5 ! We’re connected, have access to Slack, Gmail, Cloud and with talents located all over the world, we need to find flexible office solutions and Beewake can help you to find the perfect workspaces on demand whether you’re looking for a desk and meeting rooms with great amenities. What about for corporations ? It makes sense that happy employees are productive employees. Corporations believe that employee satisfaction can help them to drive productivity. 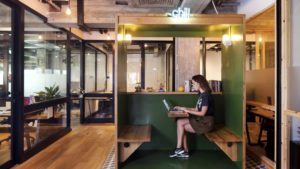 A lot of corporations are now offering coworking space on demand for their employees, it’s a shared space where you join many businesses in one office. If you’re looking for networking opportunities in NYC or a sense of community, coworking could be a strong option. Companies are using flexible office as a way to compete for top talent. We’ve seen how important work-life balance is. Great office space is a significant factor to employee satisfaction. Also, corporations are using flexible office solutions across their lifecycles. It’s not just startups or early-stage companies that want flexible options. Flexible offices are the perfect solution. If you want to learn more about flexibility at work, we invite you to check 1MFWF website ; 1 Million for Work Flexibility is the first national initiative creating a collective voice in support of work flexibility.